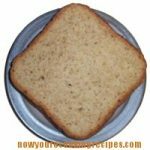 This recipe is from Trisha Gagne of Cambridge, Ontario, who writes, “This banana bread was in a very old recipe book published by the women in a tiny church in Southern Ontario. It has a really unique flavor thanks to the honey. The maple syrup version is also delicious served with butter. 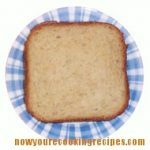 This is the only banana bread I ever make, and every crumb vanishes quickly.” Trisha adds that she lines the pan with aluminum foil, which makes it super easy to clean up, and the loaf never sticks. Banana bread sweetened with honey. With a mixer, beat together the butter, egg, honey and banana. Mix together the flour, baking powder, baking soda and salt. Add to the creamed mixture and stir until moistened. Fold in pecans if using. Pour into a greased loaf pan. Bake at 350 degrees F. for 25 minutes. Turn the oven down to 300 and continue baking for around 30 minutes, or until the top springs back when lightly pressed. Hello! What a yummy receipe! 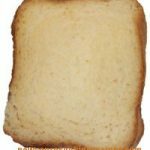 I love banana bread for breakfast! Your honey version is original! Compliments!! !